October 2 is Phileas Fogg Wager Day. The holiday celebrates key events in Jules Verne’s novel Around the World in Eighty Days. 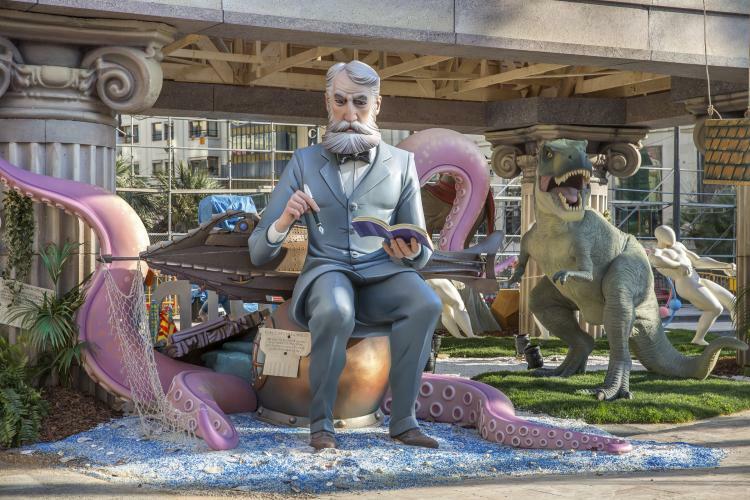 March 17, 2015: The writer Jules Verne is part of the monument presented by the city hall of Valencia, Spain. In the book, Phileas Fogg, the main character of the 1873 novel makes a wager of 20,000 pounds to circumnavigate the Earth in 80 days on October 2, 1872. This unofficial holiday celebrates the wager that set out one of the world's most famous adventure in motion. Around the World in Eighty Days is a book that covers some of the biggest changes in the world of transportation and travel that were happening in the late 19th century. Some of these included the construction of the Suez Canal, the starting of the Indian Railways and the transcontinental railroad in the United States. The novel also follows the adventures Fogg has while circumnavigating the world. The book was first published as a series in French. According to an introduction by William Butcher who translated the book to English, the closing date of the series, December 21, 1872 coincided with the last day of the wager. this made many people reading the series believe that the journey was actually taking place in real time. Read the novel and find out if Phileas Fogg wins the wager. Read the other works of Jules Verne including Journey to the Center of the Earth and Twenty Thousand Leagues Under the Sea. Watch movie and TV adaptations of the book. …that Jules Verne is one of the world’s most translated authors? Celebrate the traditionally Mexican dish popular around the world by eating it for all your meals.